October 22, 2016 — We started the night at a place called Ichabod’s Tavern. I had a clam chowder and a blood orange and vodka drink called the Headless Horseman. Lindsey had a beef stew and a cranberry and whisky concoction called Ghoul-Aid. We ended the night on a covered bridge as a real horse galloped by topped by a headless rider. We weren’t in Sleepy Hollow, New York. We were in Massachusetts. Sturbridge, Massachusetts. Sturbridge is a town on the Connecticut border about 60 miles southwest of Boston. It’s best known for Old Sturbridge Village, a recreation of a colonial-era village. I’d never experienced Old Sturbridge Village before, and technically I still haven’t. 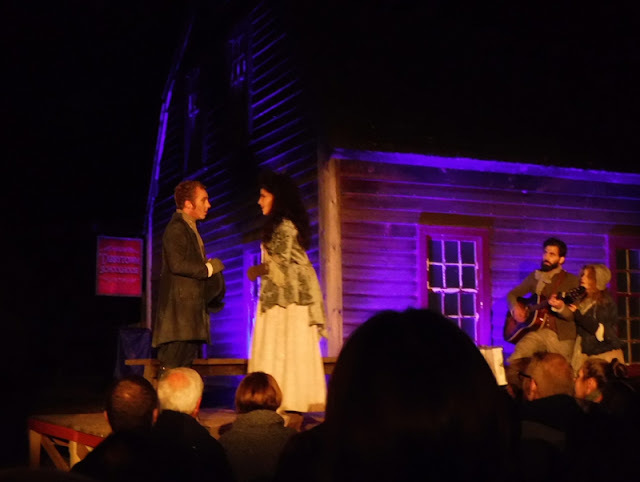 Because for this event it was no longer a mere living museum, it was a multi-site stage for an interactive nighttime theater experience of Washington Irving’s The Legend of Sleepy Hollow. I had that explanation going in, and I still didn’t know what to expect. 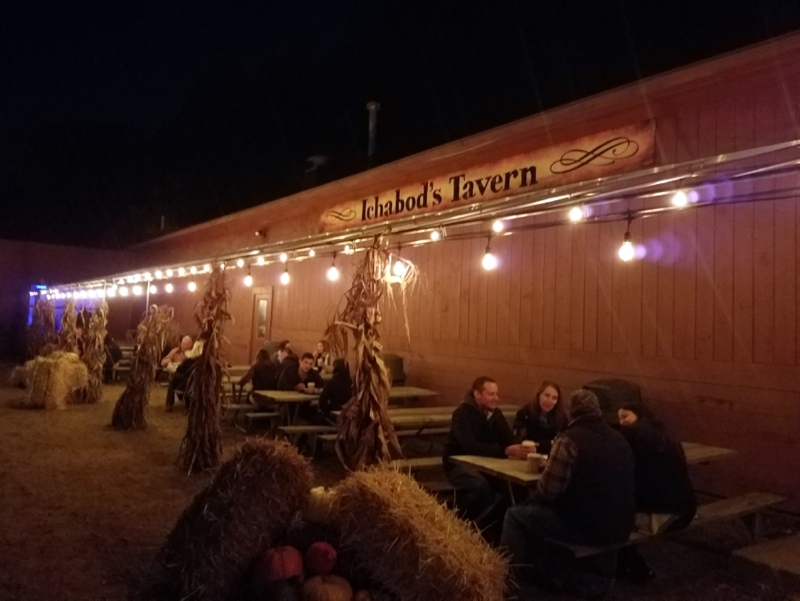 The show started at 7:30, but the website encouraged attendees to come as early as 6 to have a meal or a drink at Ichabod’s Tavern first. I’m not able to resist an invitation like that. As we pulled in, night had already fallen, and the place looked cozy. Orange bulbs on strings cast an autumnal light on a building lined with hay bales and pumpkins. A banner on the building read, Ichabod’s Tavern. 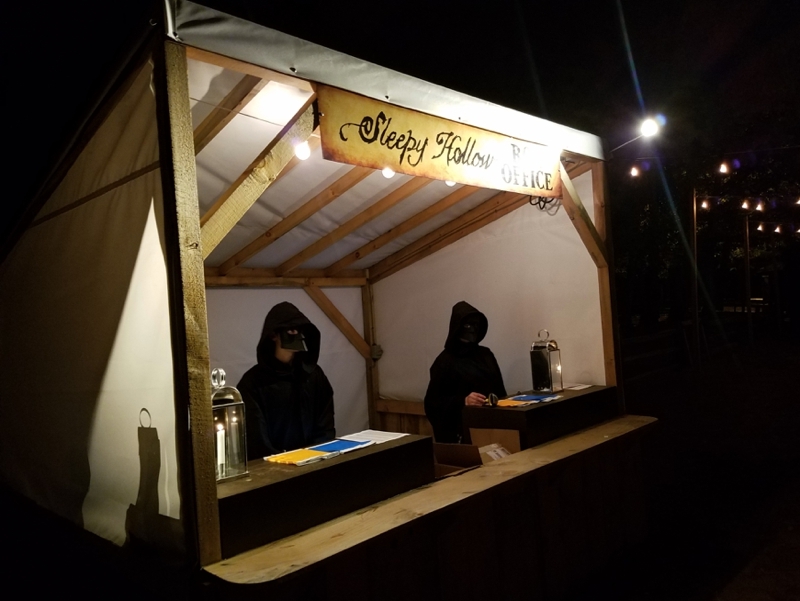 We parked in a grass lot and headed to a booth manned by two people in black masks and cloaks. “Hi,” Lindsey said to one. The person behind the till said nothing. Merely stared at us through his mask holes, took our tickets, and handed us orange wristbands. In the line parallel to ours, I heard another, “Hi.” Silence from that ticket-taker, as well. I didn’t learn the lesson. Inside Ichabod’s Tavern, after we’d ordered our dinner from a server in a quilted beige vest, I asked her where we needed to go when the event started. “I know not of this event of which you asketh, sirrah.” I had just handed her a credit card with an expiration date sometime in 2019, which she had skillfully swiped. 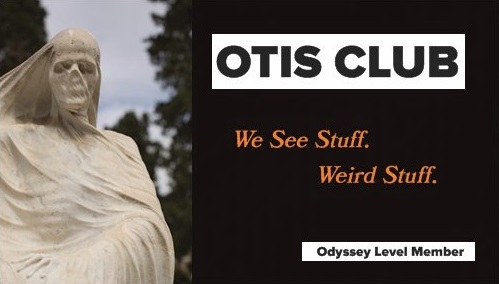 “Oh, this thing. Right.” The staff were playing it like it was the 18th century, despite the T-shirts they were selling one counter over. 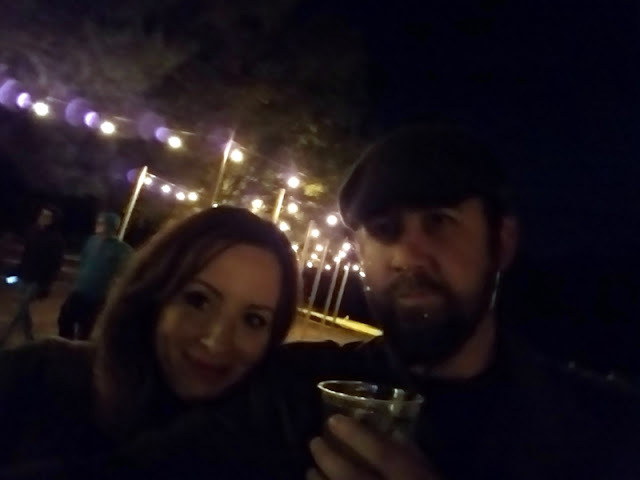 I stared down at my yellowish Headless Horseman cocktail in its plastic cup, struggling to figure out how to ask what I needed in Puritan talk. She saved me, though. “But I have heard rumblings of something happening out yonder.” She waved at the corner of the building in a way that indicated outside in that direction. 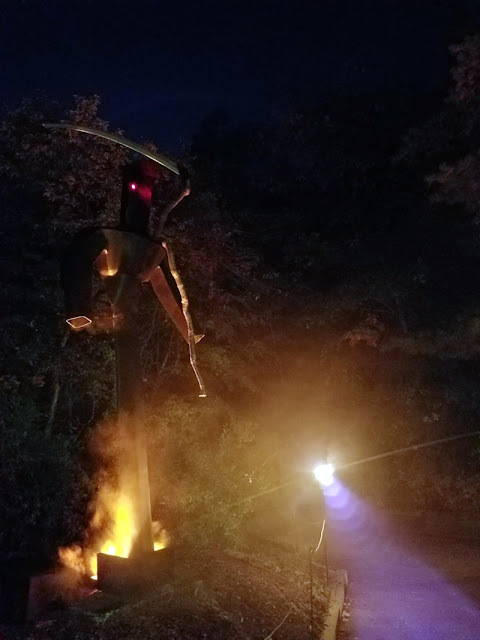 After we ate, we went out yonder where a 20-foot-tall metal grim reaper with glowing red eyes guarded a dirt path. Around us, a massive crowd was forming. Like hundreds of people. I had no idea what we were in for. Eventually the crowd started moving and we were carried deeper into the night, down a forest path lined by tiki torches and over a wooden bridge. It took me a while for my eyes to adjust to the darkness enough to see that we were being corralled and led by more of the black-masked staff, holding lanterns. The moon was big and bright above the village. I could see fires burning on little rafts in a pond, and the outlines of rustic buildings. 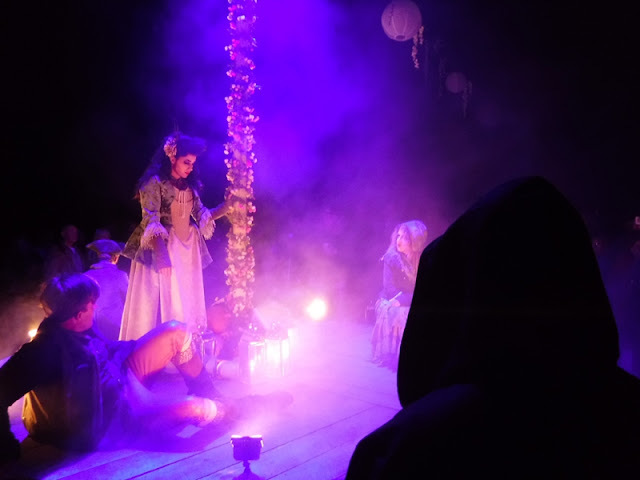 We were led into a sawmill, the interior of which burned purple as fog machines filled whatever space was left around the suffocating crowds. In the barn were five large portraits of people whom I would later learn were the actors in this theater experience. Exiting the other side of the mill, we followed the crowd across a lawn to line up in rows to face the porch of another Colonial-looking building, also eerily lit. We had been forced to the back of the crowd, making it difficult to see the porch that was about to become a stage. The actors exited the building and onto the porch. 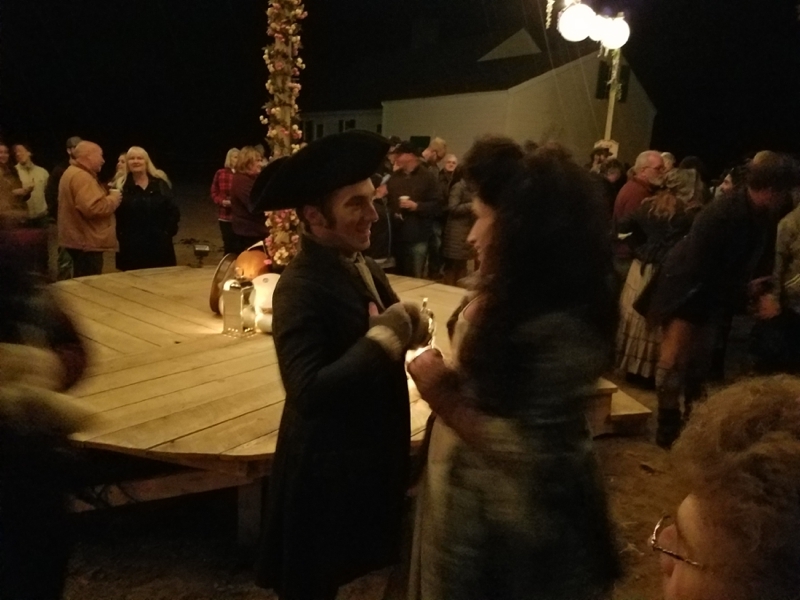 One played Ichabod Crane, another Brom Bones, a third Katrina Van Tassel, and the two others, a man and woman, were participatory narrators. Thus began the story of The Legend of Sleepy Hollow, skillfully told by the small troupe and interwoven with musical performances. And they told it spooky. Artificial lightning and thunder froze the boughs of the trees around us, the actors were all in, and the darkness around us palpable. At one point, Ichabod left the porch with a lantern and headed off behind us. 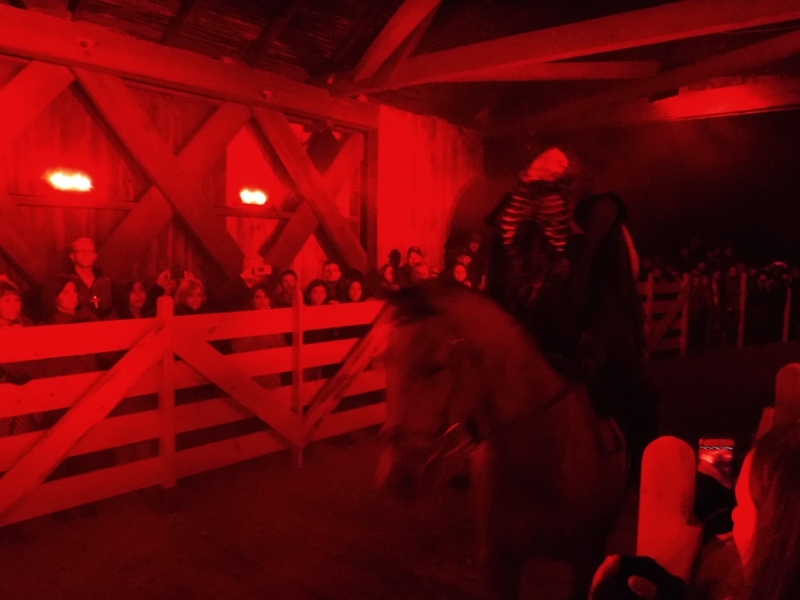 After a few minutes, a narrator told us to look behind us, making the back row we were on the front row, and we could see in the distance across the pond Ichabod exiting a covered bridge, followed closely behind by what seemed like a person on horseback. But that was just a taste of the climax. The actors took us next to another building, where we jostled for position to watch the continuing story of Sleepy Hollow, culminating with Ichabod’s invitation to the Van Tassel party and the first few inches of Brom’s jealousy streak growing. At the next stop, the experience elevated dramatically. We found ourselves in a clearing lined with simple games and refreshments stands, a round wooden platform in the middle. Pumpkins and hay bales everywhere. Lights were strung between the stands and from a pole in the center of the platform. It was time for intermission, which doubled as the Van Tassel party scene. Katrina encouraged us to buy drinks and snacks at her father’s party and pointed out the games manned by black masks. The characters mingled with the audience, pretending confusion at being asked to take photos. Brom arm-wrestled on audience member to win a kiss from Katrina. Ichabod showed an elderly woman a few dance steps, one of the narrators asked a man in a Pittsburgh baseball shirt if he was really a pirate captain. In the glowing clearing, it felt like we were fighting off the dark at an old-fashioned Autumn shindig. 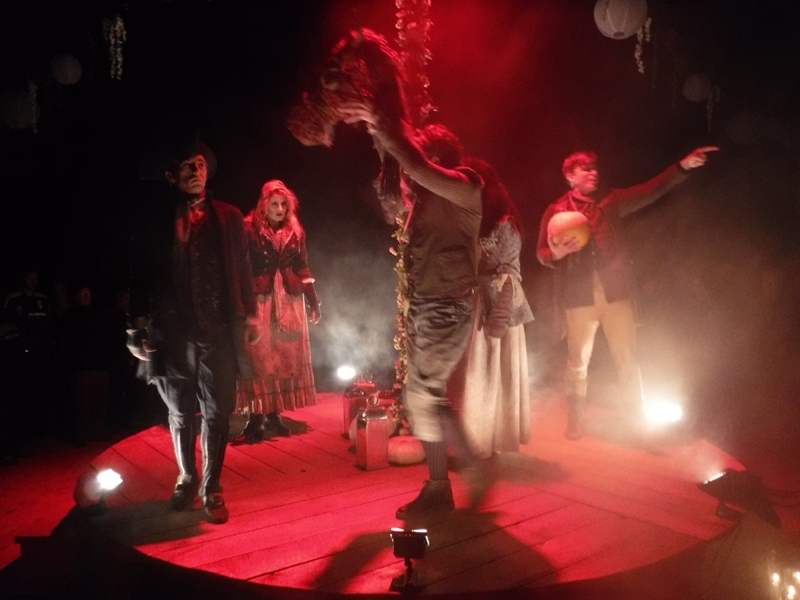 Eventually the actors ascended the round platform and continued the story, singing us somber ghost stories that ended with the tale of the Galloping Hessian itself. Brom hoisted a pumpkin. Finally, it was time for the finale. Ichabod Crane headed off toward the covered bridge, and we were encouraged to join him, shambling along behind him like a massive chorus of the damned. The path to the bridge was long and dark. Here and there a glowing skeleton moaned at us from the brush or a black mask plucked eerily at an instrument. The place had transformed into the spectral hollow where cold reign a headless spirit. Ichabod himself fought the opposite way through the direction of crowds, working his way away from the bridge, interacting comically and nervously with audience members, trying to avoid his destiny. 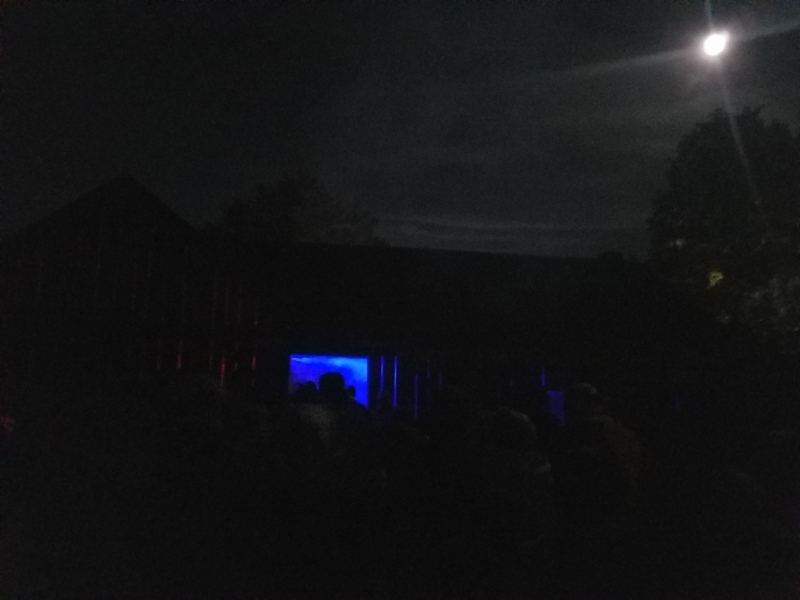 As we walked, I wondered how 300 people were going to watch a scene on a covered bridge, the purple-lit maw salivating chemical fog in the distance. As we got closer, we were split into two groups and led on each side of the bridge inside and down thin aisles demarcated by a fence to keep the middle clear. Ichabod appeared from the darkness at one end, terrified and quaking. In the darkness at the other end, a jack-o-lantern held high briefly flared into existence. The lights in the bridge changed from purple to red. The headless rider galloped down the middle. Soon it was over, and we were off to our car. The cast had disappeared. They hadn’t even broken character enough to take a bow. It was…amazing. After that first site, the crowd mattered little, and actually helped the ambiance of the party scene immensely. The five actors (and the rider) were great, the story perfectly adapted to a village seemingly laid out exactly for that purpose, and the interweaving of actors and audience and environment flawless.